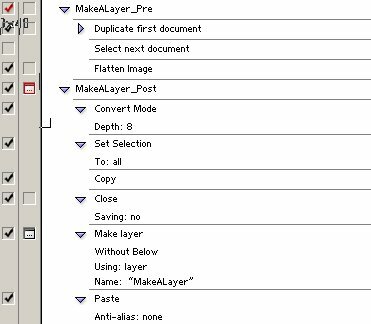 "Using Actions and Filters in Layers"
Recently I started to do nearly all operations in Photoshop inside layers. Why? The layers document what we have done to the image and the steps can be modified/improved later. The top most layer is in general a sharpening layer. If we later feel that we need to improve some of the layers (mainly adjustment layers) we remove the sharpening layer, modify the other layers and create a new sharpening layer on top of it. 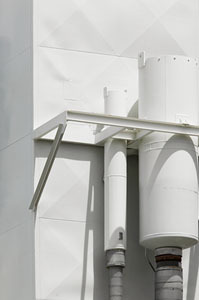 But many actions and also many filters are not designed to be used in layers. This is especially true for the excellent and popular actions by Fred Miranda. as we do not know anything about the actions or filters used by the users. You can use a slightly to strong sharpening/filter and tone down the affect by changing the layer's opacity. Photoshop 7 only allows layers in 8 bit. That way you should not use to strong operations (like major curves) inside the layers. Here you find these two simple actions for download. It makes sense to name the new layer. That way it can document what operation was done in that layer. Click on the small square in the second left column for the "Make layer" entry. 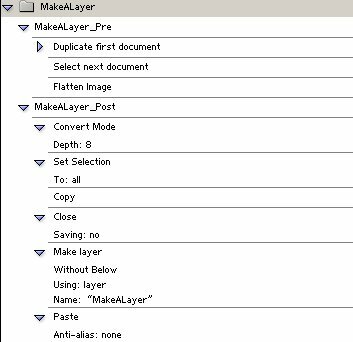 This way the "Make layer" dialog will prompt you for a new name.